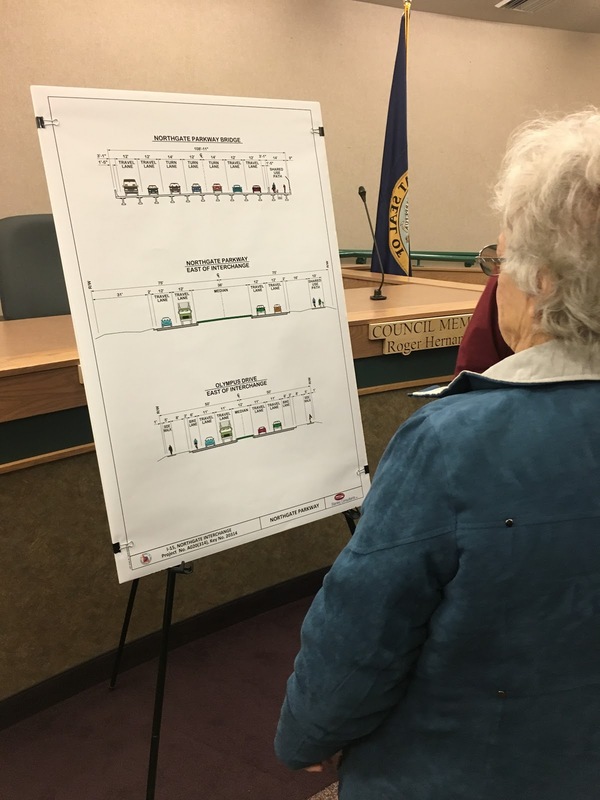 On Thursday the 25th Chubbuck City Hall hosted an open house for residents to come and learn about the new siphon interchange being built to accommodate the Northgate Development. Chubbuck’s city council chambers were full of residents of Chubbuck, Pocatello, and the surrounding areas interested in learning all about the new interchange. Corey Krantz, a traffic engineer for the Idaho Department of Transportation, says that “good access makes good business.” He believes that this interchange will provide numerous ways for the new Development to be accessed easily from the highway or surrounding roads to make sure that anyone can come explore it for themselves. Chubbuck’s mayor Kevin England says that the interchange should be up and useable by October of this year. It will be constructed around Hiline Road. Mayor England says that the interchange is being funded by the cities of Pocatello and Chubbuck, Bannock County, the state of Idaho, and a few private entities as well. The interchange should cost around $30 Million according to Mayor England. This project is Idaho’s first private/public partnership. Mayor England said “it’s setting a precedent, and I’m not afraid of that.” He seemed very excited at what this project will mean for the area and all the new people it will bring as well as the jobs it will create. When I asked Mayor England about the Northgate Development in particular he informed me that Chubbuck was focused mainly on the transportation side of things. He said that Pocatello was more involved in the industrial aspect, so I spoke to Pocatello’s mayor Brian Blad as well. Mayor Blad said that the whole project could cost anywhere from $70 million to $1 billion. Blad said that the Northgate Development will be constructed north of Chubbuck Road and east of the freeway. He informed me that it will contain a fully walkable and bikeable community complete with houses, apartment complexes, and shopping centers. It will also contain an “industrial park,” which basically means office space for tech companies. There will be no estimates on when the Development will be completed until the siphon interchange has been completed. HomeSmart Premier Realty - each brokerage is separately owned and operated. Sign up to receive emails about new listings and offers.